These Leftover Turkey Pot Pie Empanadas, or hand pies are a delicious way to use up your leftover Thanksgiving turkey! The best part of making a Thanksgiving turkey are always the leftovers! We always make a larger bird for that reason. Some popular Thanksgiving Leftover recipes are Leftover Turkey and Sweet Potato Fritatta, Leftover Turkey Noodle Soup and Leftover Turkey Pot Pie Soup, to name a few! Of course, you can also make them with chicken! 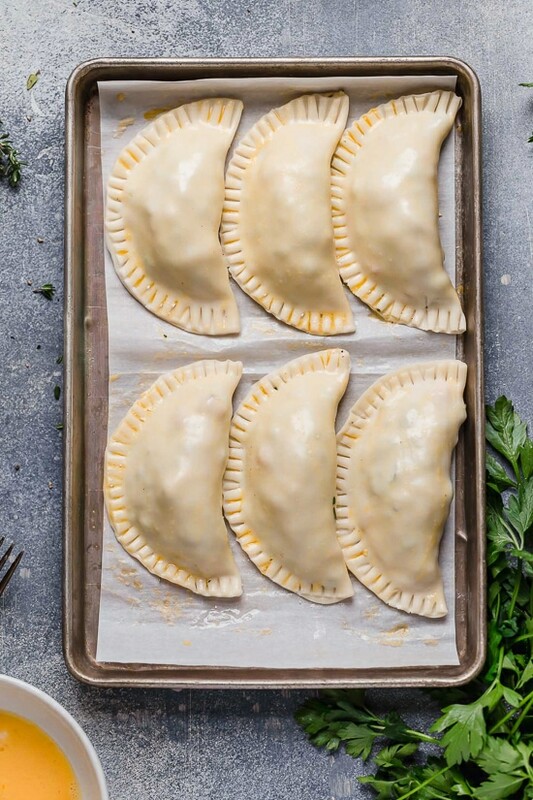 These little hand pies are baked in the oven, made with Goya baking discs which look like this and are in the freezer section of the supermarket. Be sure to thaw them in the refrigerator the night before. If you can’t find them, pie crust will work, just cut them in rounds. I have even used the bagel dough, you can see my taco empanadas here. Serve them with leftover gravy or cranberry sauce and enjoy! Heat a skillet over medium heat, melt butter. Add onion, celery, and parsley cooking until onions are translucent. Add minced garlic, cooking for an additional minute. Combine the broth and cornstarch together and mix well. Add the turkey, frozen peas and carrots, 3/4 teaspoon salt, pepper, thyme and broth, stir and cook medium heat, bring to a boil then cook until thickened and heated through, 2-3 minutes. Place a disc on your work surface. Take 2 tablespoon of the turkey mixture and place in the middle of each disc. Using a pastry brush, place the egg wash on the outer edges of the disc. Fold the disc over and gently press the edges to create a seal. Use a fork and press around the edges to seal. 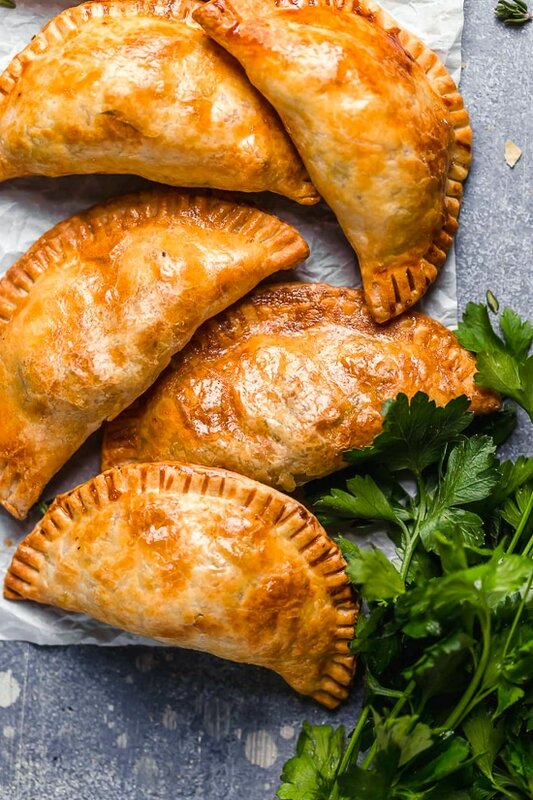 Brush the egg wash over one side of each of the empanadas. Spray the baking sheet with oil, bake 350F 26 to 30 minutes, until golden. Spray the basket with oil to prevent sticking, transfer to the basket, in batches and cook at 380F° for 8 minutes, turning half way. Eat hot. Has anyone tried making the filling ahead of time and freezing it? I haven’t found the goya disks yet and don’t feel like making dough from scratch. If you could make the filling and freeze it, how would you go about making the finished recipe from frozen filling? I couldn’t find empanada discos so I got a 11×9 sheet of puff pastry. How big am i suppose to make the disc? I bought accidentally bought regular Goya empanada discs. Do these work for baking too? Prep time is not 10min. Maybe it goes faster once you’re used to it. But I have to say this was one of the best things I’ve made!!!! Soooo delicious! Make sure you thaw the dough ahead of time. I bought the empanadas that have a recipe on the pkg that said to fry. Can I still use these in the oven or do they have to say specifically to be used in the oven? I was SHOCKED at how easy these were! Never would have attempted empanadas before. Only issue was mine still did stick a bit to the sheet pan, even with the oil. (Any tips?) 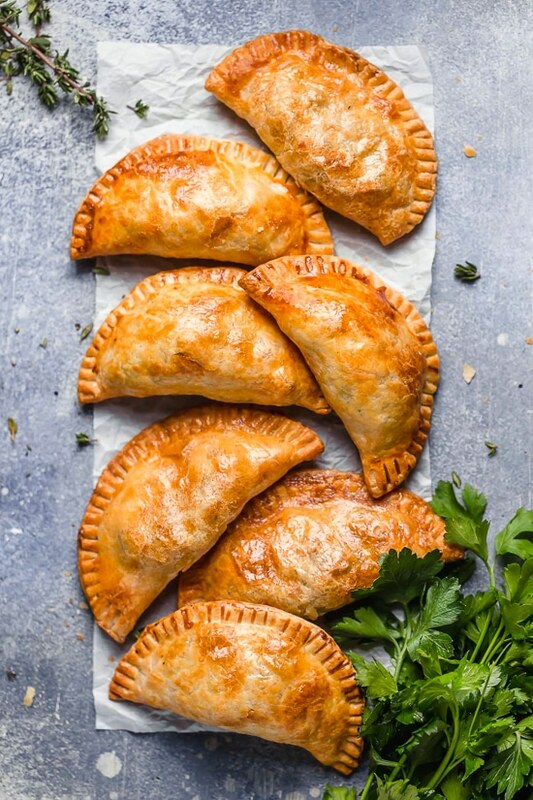 Need more empanada recipes please!!!! 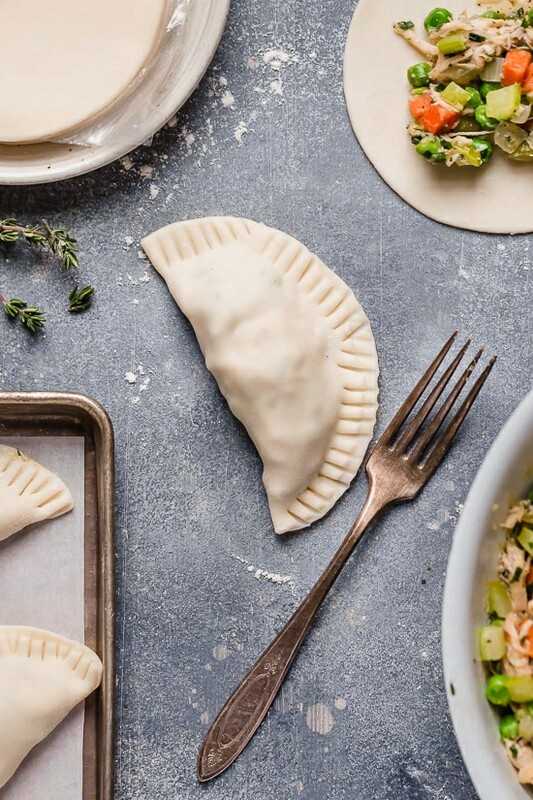 We also made these with leftover turkey and refridgerated pie dough — we LOVED them! I don’t have an air fryer but I do have a convection oven, which worked great. They turned out crispy and delicious! Thanks Gina! 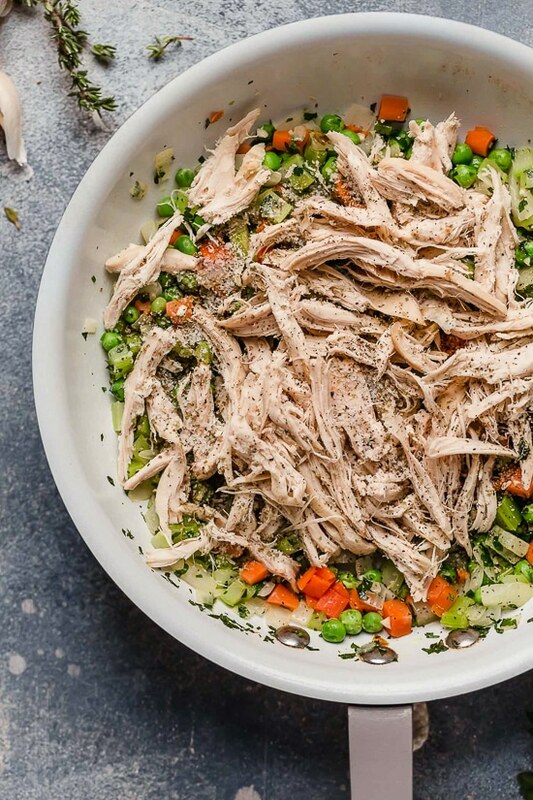 This is our new favorite for leftover Thanksgiving turkey. When I looked at this recipe it seemed too simple to be good-I was wrong! I had refrigerated pie dough left from thanksgiving and I was pleased to be able to use it. I don’ t have an Air Fryer so we baked it in the oven. It was delicious. If you are using the pie crusts make sure you are making the circles big enough to accommodate 2 tbsp of filling. Thanks Gina! I will surely try this recipe. I am a regular reader of your recipes. Can I freeze these? It’s only us 2 so I don’t want to keep them in the refrig and have them go bad. I am loving the new cook book. I have made so many of the recipes so far. Last night I made the beef stew and it was fantastic. Oh! I added fish sauce, cause I always do. It came out amazing! Question: Would egg roll wrappers work? I can find them easily, but not empanada wrappers. Also. I ‘ve lost 25 pounds using weight watchers and your recipes. THANKS GINA! I bet they would be great! Hello Gina, Do you think you could freeze these? And if so, would you freeze before or after baking? Wondering the same of the Turkey Croquettes? Thanks! I skipped the peas and carrots and loved the result! This is genius! Two of my girls favorites are pot pie and empanadas. This was so easy to make but they turned out beautiful and delicious., and I could send a few back to college with my daughter. Is there a good substitute for the egg? My son is allergic, but these look delicious! I don’t know how it would work in this recipe, but I used the “flax egg” many times when I was trying to be vegan. It’s very simple and gives you extra fiber to boot. Mix one tablespoon ground flaxseed meal with three tablespoons of water and let sit in your fridge for 15 minutes. Many stores also carry egg substitutes in the vegan/vegetarian section. 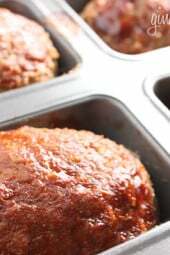 Great recipe to use with turkey or chicken. Made it with pre-made pie crust. 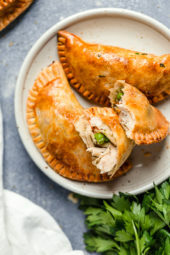 Got 7 empanadas using 2 pie crusts and the scraps. Saw the comment about using leftover gravy as the thickener and used some of that , reducing the cornstarch.All the recipes on here have been great. This week, we made the IP mashed potatoes and added some roasted garlic. Also made the IP deviled eggs. Highly recommend everything on this site. We have not found a recipe we have not liked yet. 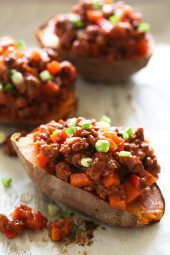 Would this work with the Greek yogurt empanada crusts? I can’t find the Goya empanada discos in my area. What can I use as a substitute for that item? Thank you!. I couldn’t find the discos either. I ended up using puff pastry. It worked pretty well! 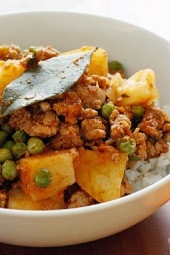 This is one of the most innovative ideas for Thanksgiving leftovers I’ve seen in a long time! I think when I try it, I might try using the leftover gravy instead of the cornstarch mixture. Can’t wait! Thanks! Great! Just dont make them too wet.